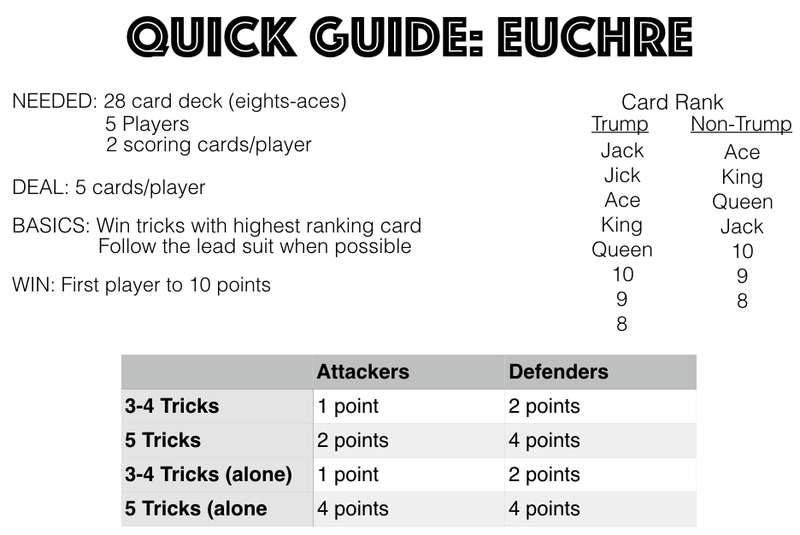 Euchre is a fun, social, trick-taking card game. 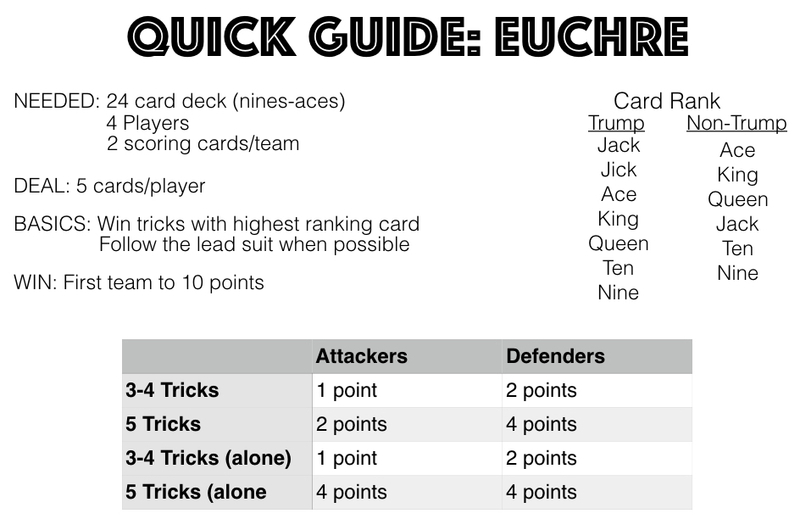 Euchre is most commonly played with four players divided into two teams. The game can also be played with five players in a pick-your-partner game play style. First, you will find the four player video tutorial and explanation, followed by the five player video tutorial and explanation. Also, be sure to check out the quick guide for each and keep it close while playing as a quick reference to help you learn as you play! Needed: 24 card deck (nines up to the aces in each suit); 4 Players; 2 scoring cards per team. Deal: Each player is dealt 5 cards in sets of 2 and 3. Flip the top card of the remaining deck over for everyone to see. Objective: To win tricks during the game play and be the first team to 10 points. Card Rank: The cards are ranked with aces being the highest and nines being the lowest until a trump suit is established. When the trump suit is established, the jack of trump becomes the highest ranking card. The off suit jack of the same suit color, known as the jick, becomes the second highest ranking card. A trump suited card outranks all other suited cards. Determining Trump: The first option for the trump suit is the suit of the card that was flipped up from the deck during the deal. The player to the left of the dealer has the first option to make that suit trump or pass. The choice moves clockwise with each pass. If the flipped up suit is chosen as trump, the dealer gets to switch a card in his/her hand with the flipped up card. If every player passes on the first card’s suit as trump, the card is flipped down. That suit can no longer be trump for the round and no card switch takes place for the dealer. The choice for trump returns to the player left of the dealer to choose any other suit as trump or pass. The choice continues clockwise until a trump suit is determined. The dealer must choose a trump suit if no other player decides one. Game Play: The player left of the dealer plays the first card. Play moves clockwise and each player must play a card with the same suit as the lead card if possible. If not possible, the player can choose to play any card. The player with the highest ranking card wins the trick. If a trump suited card was played, the highest ranking trump suited card wins the trick. If no trump suited card was played, the highest ranking card in the lead suit wins the trick. The player that wins the trick will lead the next trick. Scoring: The team that determined the trump suit is known as the attackers. The other team is known as the defenders. If the attackers win three or four tricks they are awarded 1 point. If the attackers win all five tricks they are awarded 2 points. If the defenders win three or four tricks they are awarded 2 points. If the defenders win all five tricks they are awarded 4 points. Playing alone: The player that determines the trump suit has the option to play without his/her partner. The game play is similar to the above description except with only three players playing. If the attacker wins all five tricks his/her team is awarded 4 points. Otherwise, all other scoring is the same as above. Needed: 28 card deck (eights up to the aces in each suit); 5 Players; 2 scoring cards per player. Objective: To win tricks during the game play and be the first player to 10 points. Card Rank: The cards are ranked with aces being the highest and eights being the lowest until a trump suit is established. When the trump suit is established, the jack of trump becomes the highest ranking card. The off suit jack of the same suit color, known as the jick, becomes the second highest ranking card. A trump suited card outranks all other suited cards. Determining Trump: The first option for the trump suit is the suit of the card that was flipped up from the deck during the deal. The player to the left of the dealer has the first option to make that suit trump or pass. The choice moves clockwise with each pass. If the flipped up suit is chosen as trump, the dealer gets to switch a card in his/her hand with the flipped up card. If every player passes on the card’s suit as trump, the card is flipped down. That suit can no longer be trump for the round and no card switch takes place for the dealer. The choice for trump returns to the player left of the dealer to choose any other suit as trump or pass. The choice continues clockwise until a trump suit is determined. The dealer must choose a trump suit if no other player decides one. Partner Pick: The player that determines the trump will pick his/her partner by stating a playing card. The player with the selected playing card becomes the partner but doesn’t make it known. The other players only find out who the partner is when the selected playing card is played during the round. Scoring: The bid winner and selected partner are known as the attackers. The other three players are known as the defenders. If the attackers win three or four tricks they are awarded 1 point. If the attackers win all five tricks they are awarded 2 points. If the defenders win three or four tricks they are awarded 2 points. If the defenders win all five tricks they are awarded 4 points. Playing alone: The player who determines trump has the option to not pick a partner and play the hand alone. The player who determines trump is forced to play alone if the playing card selected for determining a partner is buried in the remaining deck.